At the confluence of the Mississippi and the Wolf Rivers sits Harbor Town Island, an upscale neighborhood known for its high end homes, marina views, and miles of nature trails. This network of trails is connected to Memphis with a short bridge crossover — and from there, the options are unlimited. For the most holistic tour of the island, start out near the Tennessee Welcome Center and cross over the bridge towards Mud Island River Park. Head north under route 40 until the trails meet up with Island Drive. At the next intersection, another trail will veer off towards Mississippi River Greenbelt Park. You can continue as far as you like up that trail, taking in the water views, until it ends at Mud Island Drive. On the way back, you can detour into the neighborhood of Mud Island and enjoy the architecture of its striking homes before looping back towards the Greenbelt. If your legs haven’t quit by the five mile mark, continue your tour around the southern trails of the River Park before crossing the bridge back to Memphis. N. Mud Island Rd. at the northern end of the island also connects to downtown. Add-On: Explore some of the residential streets of the interior of the island. 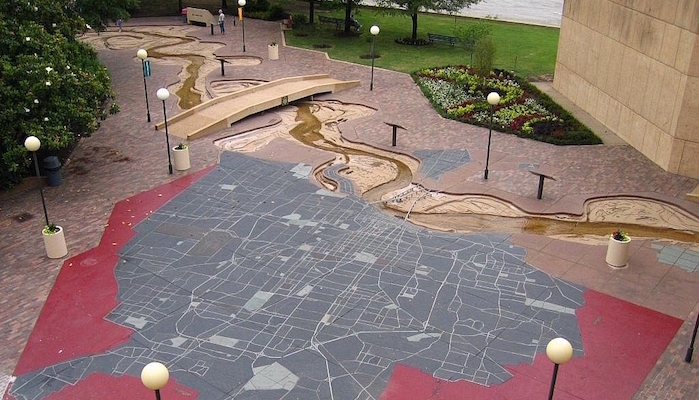 Or, in downtown, enjoy some of the River Walk trails.